Federal agencies are at a variety of skill levels when it comes to fighting improper payments and financial fraud, but a playbook released Oct. 18 by the Bureau of the Fiscal Service aims to push agencies to get better no matter where they’re starting from. The Antifraud Playbook, developed by the Chief Financial Officers Council and Fiscal Service in consultation with various oversight and user agencies, is designed for use by the entire financial management community at agencies on the federal, state, local and tribal levels. 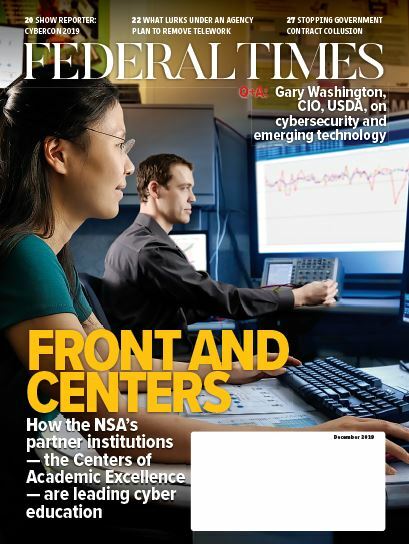 “Sometimes agencies pick up legislation or OMB guidance and think that they need to put together a large, elaborate initiative or project at their organization,” Adam Goldberg, executive architect for the office of financial innovation and transformation at the Fiscal Service, said in an interview with Federal Times. The playbook started after the Fiscal Service conducted a strategic study for financial management a few years ago, and the Department of Veterans Affairs — which was on the advisory panel for the study — approached the Fiscal Service asking for their help in using advanced data analytics to prevent fraud at the VA.
“What we said was ‘we would really like to partner with you on this, but we want to find a way that we can promote the things that we learn with [the VA] to other agencies,” said Goldberg. According to Goldberg and other Fiscal Service officials, the playbook is a part of the “Getting Payments Right” cross agency priority goal of the President’s Management Agenda. “We’ve been working very closely with [the Office of Management and Budget] on the development of this playbook,” said Goldberg. While the playbook doesn’t necessarily contain new information, according to Goldberg, it is the first time that the Fiscal Service has pulled together all of the disparate recommendations from the past into a single, straightforward document. The playbook is designed in four phases — Create a Culture; Identify and Assess; Prevent and Detect; and Insight into Action — which allow agencies to enter into the process at whatever stage best fits their current fraud prevention maturity and promotes a continuous cycle of fraud prevention actions. “We did divide the playbook into four stages so that we can look at building that culture, because that’s key to getting started: making sure that people are fraud-aware and that it is alright to bring up those risks,” said Tammie Johnson, management and program analyst at the office of financial innovation and transformation, in an interview with Federal Times. For some agencies, earlier stages of the playbook may already be covered by activities they’ve previously taken, and the stages are designed to bring in an agency wherever best suits them. John Hill, assistant commissioner for financial innovation and transformation, called the playbook an “opportunity to make the whole system more efficient” even for financial offices that fall outside the Treasury Department. “Treasury has a responsibility to really be a leader in this community of financial management,” said Hill. Agencies also have the ability to add their input or thoughts for improvement of the playbook through a link at the top of the document. Even on Day One of the playbook, Johnson has already received three suggestions for improvement. “We want to keep the discussion going, so, these were our ideas, but if agencies have others, please submit them,” said Hill. Goldberg said that the Fiscal Service also plans on meeting with agencies after the playbook’s roll out to talk about what works and what doesn’t.